Its been observed that after upgrading the database to 11gR2 (11.2.0.2 onwards) SGA components are getting resized even when automatic memory management (MEMORY_TARGET=0) and automatic shared memory management (SGA_TARGET=0) is disabled. Resize are happening to an extent that the component sizes are shrinking below the minimum size set by DBAs. This typically appears as growth in the __SHARED_POOL_SIZE value and a reduction in the __DB_CACHE_SIZE value being used in the instance, such that __DB_CACHE_SIZE may be shrunk below the DB_CACHE_SIZE value specified in the init.ora/spfile. You might think this is a bug, but this is an expected behavior. This is done to prevent an ORA-4031 error from being raised. So if shared_pool falls short of memory, Oracle extracts memory from db_buffer_cache and allocates the same to shared_pool. Is it possible to disable this expected behavior ? Yes, this feature can be disabled by setting _MEMORY_IMM_MODE_WITHOUT_AUTOSGA=false. This can be done using alter system command. Automatic Memory Management was a new feature introduced in 10g. With 10g release oracle has come up with anew parameter called sga_target which was used to automatically manage the memeory inside SGA. 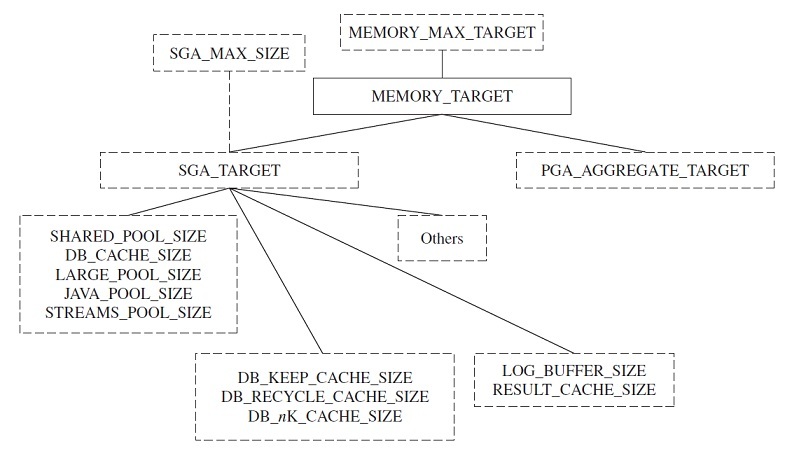 The memory_target parameter is somewhat a combination of the sga_target parameter value and the pga_aggregate_target parameter, representing the total amount of memory that Oracle has to allocate between the various SGA and PGA structures. The memory_target parameter is dynamic and can be changed up to and including the value of memory_max_target, which we discuss next. The memory_max_target parameter allows you to dynamically change the value of the parameter memory_target within the confines of memory_max_target. Thus you can adjust the total amount of memory available to the database as a whole at any time. NOTE: The memory_target and memory_max_target parameters cannot be used when LOCK_SGA has been set. Also memory_target and memory_max_target cannot be used in conjunction with huge pages on Linux. Following fig show the hierarchy of memory parameters and components that it tunes. This fig is taken from Robert Freeman book – Oracle database 11g: New features for Administrator. 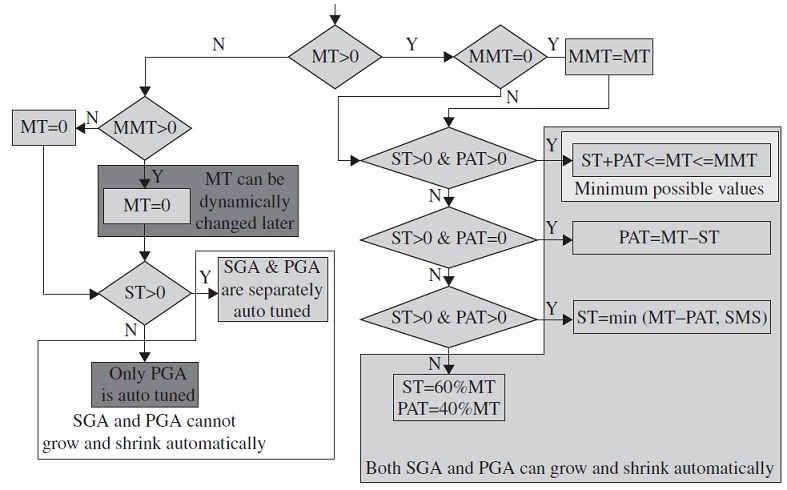 Also below fig from same book show the effect of setting memroy_target, memroy_max_target and sga_target. While setting these new parameters (memroy_target and max_memory_target), one has to be careful. A general advice would be to set sga_target and pga_aggregate_target to a minimum fixed value and set memrory_target. Oracle will automatically increase sga_target and pga_aggregate_target to the desired level. If you are upgrading the existing 10g database to 11g and want to keep the current value of sga_target and pga_aggregate_target, than make sure you set the value of memroy_target >= (sga_target + pga_aggregate_target). With new hirarchy in memeory management, Oracle has also introduced new memroy advisory. You can view V$MEMORY_TARGET_ADVICE view to get advice on the optimal value of memroy_target parameter. This view will show advisory data only after you set memory_target parameter.